MERCEDES-BENZ Australia will provide the official Safety and Course Car vehicles for the 2017 Liqui-Moly Bathurst 12 Hour, the third consecutive year the brand will have such an involvement with the event. 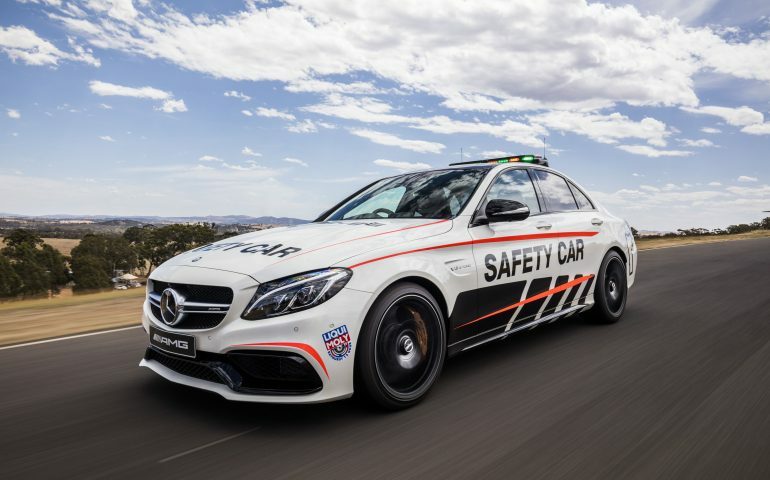 The Mercedes-AMG C 63 S will again lead the field as the official event Safety Car – its 4.0 litre biturbo V8, producing 375 kilowatts and 700 newton meters of torque, more than enough to lead a field of 50-plus GT vehicles around Mount Panorama during yellow flag conditions. Mercedes-Benz will also supply two examples of the recently launched Mercedes-AMG C 43 4MATIC range to fill the role of course vehicles throughout the weekend. The brand will also host more than 200 AMG customers at the event. “The Liqui-Moly Bathurst 12 Hour event is firmly placed in our 2017 calendar and this year sees our brand’s biggest involvement yet” said Horst von Sanden, CEO and Managing Director, Mercedes-Benz Cars Australia/Pacific. Mercedes Benz’s presence as the official Safety and Course Car provider enhances the brands long heritage in the Liqui-Moly Bathurst 12 Hour. A Mercedes-Benz SLS AMG GT3 won the race in 2013, the iconic gull-wing coupe also finishing second in 2012 and 2014 before securing strong back-to-back fifth-placed results in 2015 and 2016 against a host of later-specification machinery. 2017 will mark the competitive Bathurst debut of the AMG GT3, the brands latest contender for GT3 honours that has already continued on the incredible form shown previously by the SLS. The first Australian AMG GT3 was unveiled officially to media and fans at last year’s 12-hour event, before becoming a multiple race winner while contesting the Australian GT Championship throughout 2016. Three examples of the AMG GT3 have been confirmed in the race by AMG Customer Sports associated teams, including Scott Taylor Motorsport, HTP Motorsport, and Mark Griffith / Hogs Breath Café. The STM entry will be spearheaded by defending Bathurst 12 Hour winner Shane van Gisbergen, AMG driver Maro Engel and Craig Baird. Don’t forget to buy your tickets and camping online now by clicking the links above!